About five or six years ago, my family decided to dive head-first into swimming as a competitive sport. For three months each winter and two months every summer, swimming pretty much dominates the landscape of our lives. Recently, however at a summer league swim meet, I noticed a disturbing trend that left me reflecting on my own life. In the course of competition, it appeared that those who only participate in the sport in a more recreational nature seemed to find more joy in the race, more passion in the performance than those who have adopted swimming as a year-round venture. Granted, those are the ones who realize that most races are won and lost in the training pool. They are also aware that most cheers go unnoticed under the water and each participant is limited on how much “faster” they can really go in a given race. Still, these are the ones who seem complacent to art of competition, the thrill of the final lap and the joy of winning even a preliminary heat. It made me think about my own life. I’ve walked the Christian journey for a number of years – even “professionally” if you will. I wonder – have I lost that joy in the journey, that passion for performance? I’ve seen numerous prayers for healing seemingly go unanswered. I’ve watched Christians ignore the things that really matter in exchange for the temporal. First hand, I’ve witnessed those who give their lives to ministry burned out and spiritually numb from the experience. Yes, I know that the competition is often won or lost in the school of theology and Bible study. I am aware that emotions are shallow and fleeting and can’t be trusted. It is the Object of our faith that guides us to the finish line in final victory. But, has my training negated my passion? 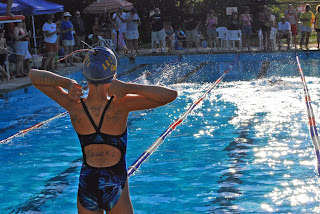 Has the joy of running (or swimming) the race been diminished by the inevitable outcome? Has the whole process become commonplace to me? Lord, give me the discipline of the committed athlete, but in it all may I never lose the simple joy that should come with each lap completed. And may the smallest of victories thrill my heart as a token of Your love for me.